Zebra CC5000-10 kiosk systemis a Simple, efficient self-service that serves customers in retail, hospitality and in public areas as an electronic services employee. Kiosk system for interactive customer service and 10'' touch display igital Signage with a complete entertainment system based on Android platform. The platform relieves the reception area by interactively answering a variety of questions. The CC5000-10 even finds a home in corporations, for example, as a video conferencing monitor. Even in reception areas or in various service points the optically appealing system greets customers and supports them as an interactive helper with their orientation in the reception area of a business or hotel. 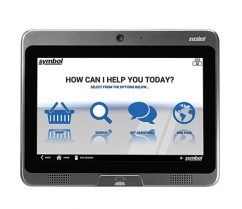 The CC5000-10 computer system features an integrated 1080 pixel touch screen with projected capacitive multi-touch technology. This way, customers using the system operate it as intuitively as their own tablet or smartphone – including swiping, zooming, turning, etc. Otherwise the concept of the CC5000-10 is aimed at customer service. The integrated 8 megapixel camera and barcode imager for capturing 1D and 2D barcodes offer a comprehensive range of functions. Whether making a price check, purchasing and paying or for video sales assistance – the possibilities of this interactive customer service are multi-faceted. Of course, the camera is also usable on all types of video support for both internal and external employees, as well as for video conferencing on a business level. The integrated microphone ensures for excellent voice quality. Bothersome background noises are simply muted, for a clearer tone. The integrated PC system of the CC5000-10, equipped with a 1.5 GHz processor, 1 GB RAM, up to 64 GB Flash works autonomously as a multi-media device on an Android basis. A software development kit, central management, as well as extra accessories offer you an entire range of adaption possibilities. This way, you also easily implement a complete shopping terminal, including card reader and receipt printer. At the same time customer satisfaction increases, since the customer no longer only needs to rely on personnel. This saves the shop owner additional costs, since his personnel is now able to concentrate on other tasks. Via simple pairing of one's own smartphone with the Zebra CC5000-10 customers have the possibility to load real-time special offer coupons onto their mobile device, receive rebates, as well as participate in games of chance, etc. Together with the well-engineered and professional analysis functions of the CC5000-10 kiosk system, retailers are very well positioned. They easily evaluate which applications customers find most interesting, which sites they visit, how long they visit them, etc. – for even more effective marketing and sales tools, higher profit and long-term increased customer loyalty.